Seriously. Just when I think I get the hang of this knitting silk lace in the round, I eff it up and come to a point where a drastic decision must be made. To tink or to rip back? Lets just say I tried both methods. And guess what, the tinking back did not help my mistake. Instead, it made the silk lace 2-ply yarn into a fugly fuzzy mess. 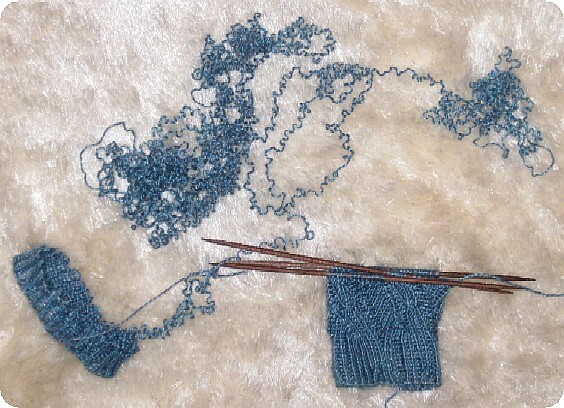 I had been warned about this SeaSilk yarn before, but thought that I could master it. Bah, was I wrong! One needs to acknowledge when one cannot go any further and has to start over; which is what I did. However, as I ripped out the wee lace stitches, a Horrible Thing Happened (HTH). The lace, which was already fuzzy from the tinking, then became an impossible self-imposed knot that refused to be made back into smooth-running yarn. BAH. O, the curses that streamed forth from my mouth! I admitted defeat and put the knotted mess to one side (as evidence of my struggles) and cast on again. This time, I’m happy to announce that all is well – knock wood. I’m back to where I was before the HTH and I’m about to start the thumb increases. Sorry the photo is a little craptastic. You are currently reading Sometimes the way forward is the way back… at When Gaia Smiles.